THE forces raised by the great Dominions of Canada have proved themselves worthy sons of the Empire, and have added Imperishable glory to the annals of the youngest of the daughters of the Mother Country. In Lieutenant Neville Ayrton Astbury they have lost a brave lad and a gallant soldier. He was the son of Edward Astbury, Esq of Grosvenor Cottaqge, Northop, Flintshire, and was born 6th April. 1889. He was educated in the neighbouring village of Hawarden, long famous as the residence of the great English statesmen, William Ewart Gladstone, and from there he went to Lampeter College. 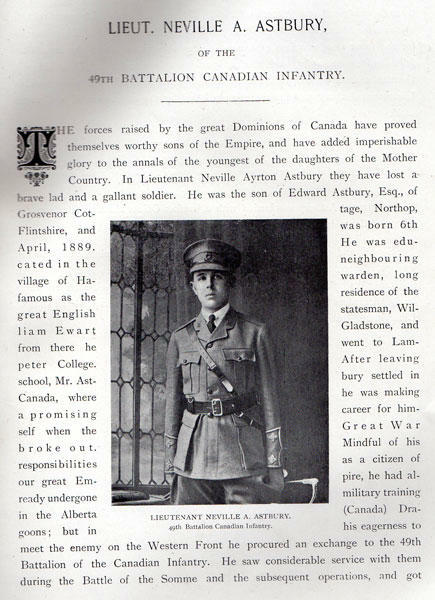 After leaving school, Mr. Astbury settled in Canada, where he was making a promising career for himself when the Great War broke out. Mindful of his responsibilities as a citizen of our great Empire, he has already undergone military training in the Alberta (Canada) Dragoons; but in his eagerness to meet the enemy on the Western Front he procured an exchange to the 49th Battalion of the Canadian Infantry. He saw considerable service with them during the Battle of the Somme and the subsequent operations, and got through safely till, on September 16th, 1916, he was sent, with seven others, to reinforce a trench at Courcelette attacked by the Germans. They started for the front of the trench in face of a most vicious rifle and machine gun fire. One fell dead immediately, and another was severely wounded. Then came a German counter attack, preceded by a heavy shell and rifle fire, during which Lieutenant Astbury was instantaneously killed by the concussion of a German shell. 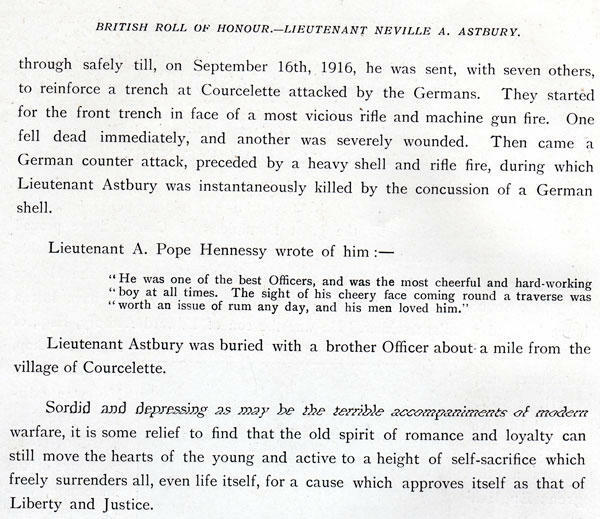 Lieutenant Astbury was buried with a brother Officer about a mile from the village of Courcelette. Sordid and depressing as may be the terrible accompaniments of modern warfare, it is some relief to find that the old spirit of romance and loyalty can still move the hearts of the young and active to a height of self-sacrifice which freely surrenders all, even life itself, for a cause which approves itself as that of Liberty and Justice.